Born May 24, 1945, a native of St. Louis, Missouri, Ed has been residing in Edwardsville, Illinois since 1970. He is a graduate of the Washington University School of Business with a major in accounting in 1967. Ed served in the United States Marine Corps from 1967 through 1970 attaining the rank of Captain. After his time in the service, he attended the University of Illinois and Washington University Law Schools, graduating from Washington University in 1973. He became a Certified Public Accountant in Illinois in 1974. 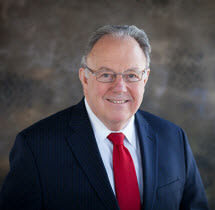 He has been practicing in Edwardsville, Illinois since 1973, gaining extensive experience in real estate, probate, estate planning, wills, trusts, banking, and general business law. President of the Edwardsville-Glen Carbon Chamber of Commerce in 1989. In his years with the Chamber, Mr. McCarthy was instrumental in both the move into and from the structure known as the "Berlemann House", the growth of the Chamber of Commerce in reaching out to legal and medical professionals, and the development of awards programs such as the Athena Award and Albert Cassens Award. President of the Edwardsville Police Pension Fund Board of Trustees from 1988 to 2000. In his capacity as a long-time member of the Board of Trustees, Mr. McCarthy was active in the administration of the pension fund and the designation of the beneficiaries and the supervision of the investments of the fund. President of the Roman Catholic Diocese of Springfield School Board from 1990 to 1994. In his years of service to the Roman Catholic Diocese of Springfield School Board, Mr. McCarthy contributed to the adoption and implementation of policies and procedures strengthening the academic standards of the schools in the Springfield Diocese, Which includes the local schools at St Mary's Parish, St. Boniface Parish and St. John Neumann Catholic School in Maryville, serving parishes including St. Cecilia's in Glen Carbon. When away from the office, Ed is likely fishing. Southwestern Illinois Regional Multiple Listing Service, Inc.